Four years ago, my wife and I gave up trying to tame our backyard (steep hill, runoff, cobblestones, horrible soil,etc.) 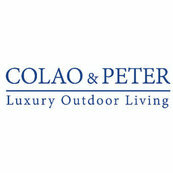 and turned to J.R. Peters of Colao Stone for help. J.R. and his company were the answer to our problems. J.R. guided us through an assessment of our design and life style likes and dislikes and came up with a woodland garden design. Today, four years later, J.R.'s individualized design plus his choice of trees, plants, and stonework have turned our backyard into a beautiful oasis that we enjoy every season. The Federal City Group, Inc. Thank you for your review. We are so happy that you enjoyed your experience with us.